I find that very thin G10/FR4 works well as a light diffuser (example: http://www.mcmaster.com/#grade-g-10/fr4-garolite/=cu0kwg). This might be good for still life photography, although for portraits of human subjects, a strobe is far superior to continuous lighting. To get decent soft lighting with continuous lighting you might need 1000 watts of light or even much, much more if you want to use small apertures for wide depth of field. Your models will not appreciate thousands of watts of heat being blasted at them for very long. I recently removed the LCD panel from a broken 17″ monitor, which makes for a very even, surprisingly bright, VESA-mountable softbox (though it mostly gets used as my regular desk lamp). True, but I can’t think of many photographers that would prefer* a harsh and direct strobe to a diffused one. *Depending on what sort of artistic lighting you want to do. Diffused the strobes, then. Lots of soft light, still get the fast burst instead of the constant source. I would just be afraid of incandescent lights because of the redder colors, but the un-measured paper will probably need more color correction than the light in this case. Strobes are nearly always diffused in studio and outdoor settings. umbrellas, softboxes, they’re standard kit for a professional setup. There are exceptions, but they are done for artistic expression. Incandescents actually have the best light spectrum distribution of any currently available light source, being closest to that available directly from the sun. Everything else is a discrete subset of the light spectrum, and hence, will require more colour balancing/correction than that plain ole incandescent. The only reason we don’t use them, is because they get hot and are energy wasteful. btw, red lights work very well on skin. Good to see more photography hacks here. It’s a fast growing field, and it’s nice to see what other people are doing. Yeah, that’s basically what I was saying in regards to Colin’s post. It was just that I didn’t understand the basis of his criticism. Well, I understood it but it seemed ancillary to this hack. 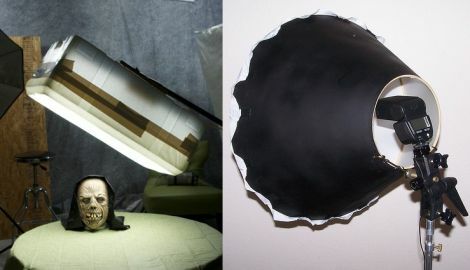 This hack is about making softboxes, not what kind of light to model with. Pointing out that strobes are used seemed odd because it doesn’t really have anything to do with this hack. Apples and oranges really. Of course, all of this missing the obvious in that the second hack is clearly making use of a strobe, it’s right there in the picture. one being a simple L- bracket and hotshoe mount would allow for a strobe. two being I was intending to shoot video with my d-slr, hence the constant lightsources. @y Jean-Paul “Incandescents actually have the best light spectrum distribution of any currently available light source”..
Yeah right, and water and sand are actually the rarest substance on the planet.. I mean sure cheap fluorescent is know to be spiky and not that good but to claim incandescent is best of ‘any currently available’ is just plain grade A nonsense.